Natural silk for several thousand years, is one of the most luxurious fabrics, a kind of elite in textile world. Modern technologies, allowing to obtain almost complete analogs of this material, complicate the process of recognition of real silk. To protect yourself from fraud by unscrupulous sellers, you need to have an idea about how to determine natural fabrics. Conduct a chemical experiment, dissolved in 150 cubic centimeters of water 16 grams copper sulphate, 10 grams of glycerin and caustic soda. In the resulting clear solution dip a piece of silk. If the fabric is present, it is completely dissolved. Pay attention to the price of: natural silk does not come cheap. If you poke in the silk fabric cigarette on the surface will only have blown the hole, the material itself is not light and will not smolder. Attach the silk to her cheek. You don't have to feel no discomfort, and silk, befitting its title "second skin", you should immediately take your body temperature. Please note colour of fabric: natural silk has a soft, pleasant sheen that won't fade with age. In the sun, this fabric shimmers and plays different shades, while artificial has a white glow. Silk thread can not be perfectly white, it has a light creamy shade. Gather the fabric forming the folds, squeeze it in his fist and rate the result. On the artificial tissue will be a clear creases, natural will be a little wrinkled. 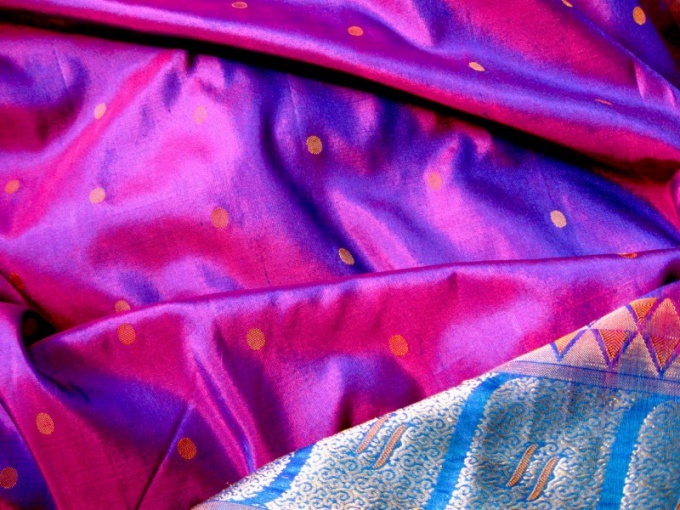 Silk handmade made of real fibers, has a visible surface defects: irregularities, discrepancies and toe fabric. Fake not to have any defects. Pull some threads from the seams located in different parts of the product to ensure the homogeneity of the fabric. Try to break the silk thread. If its end will remain connected mass of fibers, means you are natural silk. Moist filament of natural silk should end up under the influence of the same efforts, which breaks dry. Light the tip of the thread. Silk exposed to flames quickly forms a black lump, spreading the smell of burnt horn or feathers, stops burning during the liquidation of fire. Clotted ball of silk, like embers, is easy to apply to hands.